An interesting and useful guide, written in a competent, but dry style. By the reign of Louis-Phillipe, Paris was Europe's cultural capital and, like Vienna, attracted many of the greatest musicians and composers of the era. While much has been written of the musical scene in Vienna at the time, much less has been written about Paris, and Simeone, a lecturer in the Department of Music at the University of Wales, attempts to fill the gap with a well researched and comprehensive Baedeker of the city's musical scene. It includes biographies of the major composers who made Paris their home, the addresses, locations of their graves (if in Paris), and listings of all important musical locales, arranged by arrondissement and street, along with the nearest Métro stops. Also found are four walking tours and copious photographs, contemporary and historic. Simeone gives us small details that add pleasure and interest (e.g., composer Marcel Dupré, organist at Saint-Sulpice for 65 years, was also the organist at the wedding of the Duke of Windsor and Wallis Simpson). Of Joseph Canteloube, arranger of the celebrated Chants d'Auvergne, Simeone writes, `During the early 1920s he made several pioneering music broadcasts for French radio. . . . The first of these [on Scarlatti] was broadcast on 28 January 1924 under difficult circumstances: rain was leaking through the studio roof, and an assistant had to hold an umbrella over Canteloube as he played.` Simeone is a genuine scholar of both music and Paris and he has thoroughly researched both subjects. Just the same, our pleasure would be enhanced if Simeone had been able to write in a livelier style. While his writing is clear and factual, it seldom rises above the expository. Rife with information, it is a pity that a book on such a rich topic should be written in the arid manner of a college textbook on macroeconomics. 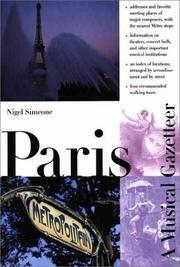 Style notwithstanding, any visitor to Paris with an interest in music will find this guide indispensable.